The Young Victoria’s producer’s Martin Scorsese and Sarah Ferguson starring Emily Blunt and Rupert Friend has rekindled an interest in Queen Victoria(1819-1901) Britain’s longest reigning monarch. “If it were not for the honest faces of dogs, we should forget the very existence of sincerity”. 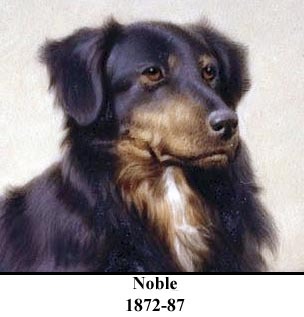 The Queen’s diary reveals that the same day in 1837 that she was crowned, she came home to give her cavalier king charles spaniel Dash a bath. The young Princess Victoria was the only legitimate child of the fourth son of George III, the Duke of Kent, who died in 1820. As such, she became heiress presumptive after the death of George IV in 1830. Victoria’s mother, the Duchess of Kent, would act as Regent during the Queen’s minority, if she acceded to the throne while still a minor. 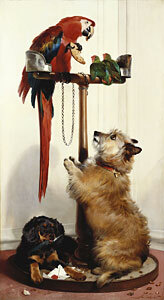 Dash also played a part in bringing Victoria and Albert together. On their first meeting Victoria was taken with the tall, serious, blue eyed Albert, but it was his behaviour toward Dash which sealed her aproval of him. She recorded in her diary that “Albert played with and fussed over Dash”. 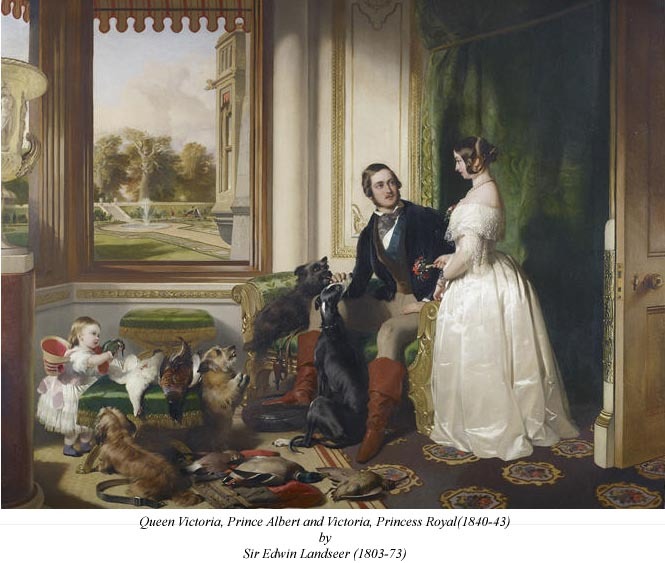 Throughout her lifetime, Queen Victoria commissioned many dog portraits. 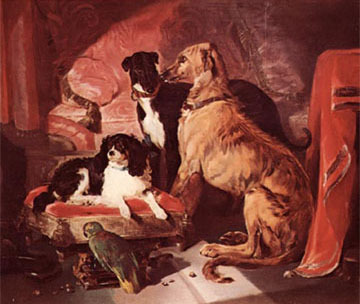 Although artwork featuring dogs goes back centuries before her time, her influence significantly increased the popularity of dog art, especially portraits of pet dogs. In John Plunkett’s book “Queen Victoria: First Media Monarch” he points out that Queen Victoria was the first British Monarch to use the media to her advantage. Queen Victoria at Balmoral 1896 and during her Jubilee Celebrations 1897: Turi, Queen Victoria’s cherished pomerainan often accompanied the Queen on her carriage drives in the last years of her life. Queen Victoria was one of the best known Pomeranian owners in history. She first saw the dog as a girl, when her mother, Queen Charlotte kept one as a pet. Queen Victoria got Marco, a Pomeranian of her own, in 1888. 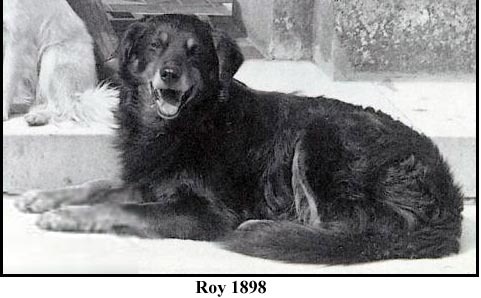 Roy Roy was also a constant companion to Queen Victoria. 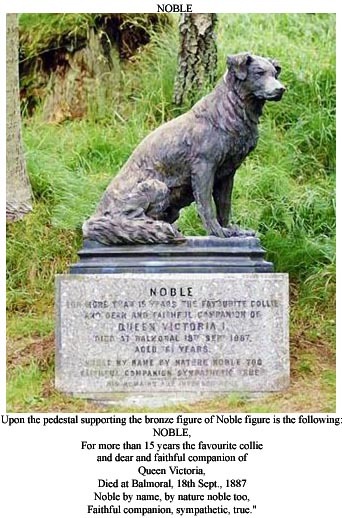 The Society for the Prevention of Cruelty to Animals (SPCA) was founded in 1824, it adopted its current name The Royal Society for the Prevention of Cruelty to Animals (RSPCA) after being granted royal status by Queen Victoria in 1840. Helen Rapport writes in her book Queen Victoria: A Biographical Companion on page 38: During the ministries of Disraeli and Gladstone Queen Victoria began lobbying her ministers to bring in legislation to control the growing practice of vivisection in medical schools- a practice that horrified her. She subjected Disraeli and many other ministers on the suffering of dogs. She corresponded with the home secretary Sir William Harcourt, himself a leading antivivisectionist, referring to a recent court case involving a vivisector, she insisted: “This must be stopped -It is a disgrace to a civilized country” Source: (Gardiner 1923, 403). 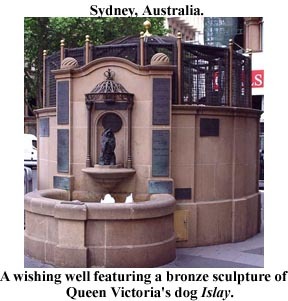 Under pressure the queen and the antivivisection lobby, led by a powerful female advocate of the cause, Frances Power Cobbe, Disraeli was eventually forced to call a royal commission on the subject. 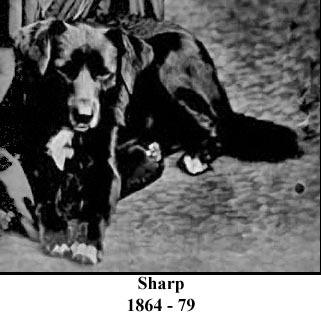 ; which resulted in the passing of the Cruelty to Animals Act of 1875; which included compulsory anesthesia of animals being vivisected and their prompt humane destruction as soon as the experiment was complete. In 1885 Queen Victoria was still writing memorandums that “her poor dear friends the dogs” should never be destroyed unnecessarily or kept muzzled unless they were know to be dangerous. (Source: St. Aubyn 1991, 433). She also wished to see stricter controls of abattoirs. In her view “nothing brutalizes human beings more than cruelty to poor dumb animals, whose plaintive looks for help ought to melt the hardest heart” (Guedalla 1933, 2:152 , and the queen funded school prizes for essay writing on kindness to animals. She also supported the work of the Royal Society of the Protection of Birds and condemned the use of feathers for trimming ladies’ hats.